Can a dog be affected by a stinging nettle? 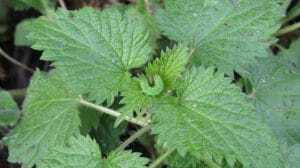 As the weather warms up, and we see new growth appearing along the hedgerows and in the countryside, dog owners need to realise that it also heralds the beginning of stinging nettle season. Nettles of the stinging variety tend to grow in clusters, typically in areas of moist, uncultivated soil and are known to grow quite tall, producing small green-whitish flowers and small egg shaped fruits later in the season. The Latin name for this perennial is urtica dioca, used in medicine and as an herbal remedy, first discovered in ancient Greece. Nowadays, it’s found worldwide, but more predominantly in Asia and the cooler regions of Europe. The stinging nettle blooms from June until September, and reaches between 2 and 4 feet in height. The stems and leaves of the stinging nettle are covered in small, fine hairs (trisomes), and it’s these that contain histamine and acetylcholine, chemicals that may cause contact dermatitis not only in humans, but also in dogs, when skin contact is made. When the young nettles first appear, their sting is much more virulent, but as they grow taller, they become less potent. Quite often, when I’m out dog walking in the woods around Finchley, we come across a crop of stinging nettles, and although I do my best to prevent the dogs from coming in contact with these nasty plants, it’s sometimes rather difficult to prevent the dogs from taking a sniff and walking into them. If you suspect he has eaten and swallowed the nettles, or the dog’s eyes have been affected, contact your Vet who can provide care to treat the ailments. For lesser symptoms, of redness and itching, while on your walk take a look around for dock leaves. These plants can commonly be found in close proximity to nettles and contain a natural remedy for any nettle sting. Crush the leaf of the dock plant with your hand and rub the juice onto your dog’s paws. Once you’re home, if your dog appears to be still suffering, there are several remedies that you can try to relive the stinging from the tiny nettle hairs. Wash any affected parts, face, legs, whole paw or pads, with soapy water which can help to remove the tiny filaments that are like minute glass rods. If possible, try to stop your pet from rubbing or scratching the irritated areas, as this will only cause it to itch even more. Apply a made-up paste of bicarbonate of soda and water to the sore areas of skin, or if possible, stand your dog in a bowl of this solution. Calamine lotion applied to the paw pads will soothe the area, but your dog will immediately try to lick this off. If your Vet has previously prescribed Piriton antihistamine for your dog, give him a dose to reduce the reaction. Anti-inflammatory medication may also help in this situation, but only if prescribed by your Vet. Although they’re considered to be a weed, and most often a nuisance, the nettle is also a resourceful herb when it’s dried, as the components that cause these allergic reactions are not active when the plant has been chopped and dried out. The weird fact is that the stinging nettle is very often used for dog’s skin problems, the very problem it can cause when growing. Nettle is used in products to encourage the coat to flourish, in hair loss and scurvy coat conditions. The whole nettle plant, the leaves, stem and even roots have all been discovered to have many positive, powerful and beneficial vitamins and minerals. Of course, as with any herbal or plant based treatments, always consult your doctor to make sure that they don’t complicate or have any adverse effect on any current medication or treatment you are taking. Kennel Cough is on the increase this year – has your dog been affected?